It provides me with a fee H2 priest and a bunch of militia. And just in time, too! I give my new priest a Jade Knife and order him to sacrifice 4 slaves, many of which were brought in by the lone Witch King I had hunting. That Witch King now has a Sanguine Dowsing Rod (SDR) which will allow him to blood hunt as if he were a B3 mage instead of a B2 mage. I also plan to send those militia to the blood hunting province so that they can help patrol away any unrest there. Even though I have only a limited blood hunting operation, I hope that it will be enough to keep my dominion alive. It's possible that some day I may actually get a full-scale blood economy rolling, but right now I have other tasks for my Witch Kings and I cannot spare them for a distant future scenario that may never materialize. My large army has split into two parts. The Enaries only have mapmove 1 and therefore they are trailing behind the rest of my force. The main force takes a slight detour from their march to Pangaea, because Lanka just teleported a Raksharaja into the Cacian Forest, a Hinnomese province that is on my border. I move the faster part of my army to the neighboring province of Lama so that I can prevent any Lankan incursion. The slower Enaries will continue toward Pangaea without distraction, and even so the Witch Kings and Androphag Archers will have no problem catching up. Mapmove 1 is pretty terrible. 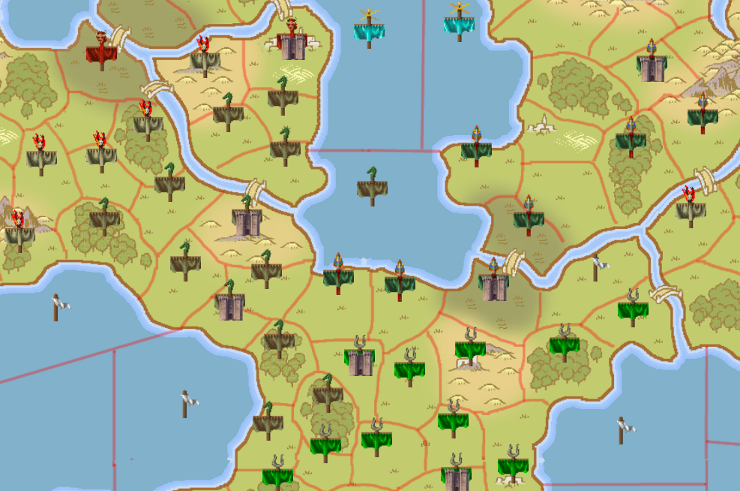 I've forgone all recruitment this turn so that I could build two new temples, one in each of the two provinces between my capitol and my fort in Worshin. I am not taking the threat of domkill lightly. At this point I am talking with Hinnom and with Mictlan. I have nothing to say to Lanka and I'm deliberately maintaining radio silence with Pangaea. Meanwhile I start talking to T'ien Ch'i about possible coordination efforts against Pangaea. I also saw that Arcoscephale sent a Shishi or two into the ocean. My small force down there is still busy patrolling away the very high unrest, but Dexanth wants to have access to attack Lilli's southernmost provinces (the ones on my border). The diplomatic tension between Arcoscephale and myself was rather interesting at this point. Dexanth could see that I was no longer actively fighting TheDemon any more, although I was able to honestly point out that my slow Enaries and the detour I made with my Witch Kings put me in a poor position to move against Lilli. I also pointed out that Pangaea's dominion made the halfmen a more immediate threat to me than Mictlan. Dexanth responded that I was being short-sighted, that I should discuss my dominion concerns with Pangaea and make formal peace with TheDemon. His hope is that he can broker a peace between all the warring nations and form a grand alliance against Mictlan. I want to know what's in it for me. He responds that I could at least have the one or two provinces of Mictlan's that are on or near my border. That would allow me to meet my Irrational Objective to "control the entire isthmus" but that is all it would do. Lilli would probably be able to take it back pretty easily, and I would be stymied by her fort full of Circle Masters while she brought down a bigger force on my head. Without easy access to teleportation or sailing, my options for raiding are pretty limited. My response to Dexanth is that I will join him if I can have the ocean provinces. I could use them to access Mictlan, and it wouldn't be too difficult for me to gdivert some of my forces underwater right away. Also, I'm taking a gamble by committing to the attack without a guarantee of support from anybody else. Dexanth responds that he has no reason to give up territory that is easy for him to take and hold. My response to him is that he wants me to risk a lot by going to war with Lilli, with no gain beyond possibly holding a couple of provinces at least until Lilli's response crushes me. I would not be an effective ally and I have little to gain. The only incentive I've really been given is that if I don't do it, I will eventually be destroyed. Anyway, if Arcoscephale is completely destroyed then Wrath of God disappears and I stop losing archers and having Witch Kings accumulate chest wounds and other afflictions. At about this point in the conversation Dexanth grew frustrated with my demands and gave up on pulling me into the alliance. The conversation at the time was actually more animated than all of that, and really it took place from about Turn 37 through Turn 39, but hopefully you have some idea of my "view" of how the war between Arcoscephale and Mictlan was shaking out around this time. 4. Extract blood price from Arcoscephale (312 gold). Interesting things continue to happen to other people. Hinnom clears out the Lankan raiders on my border, and the Witch King portion of the army turns back toward the Pangaean border again. They all still have some distance to travel so that's not interesting. Arcoscephale's Shishi(s) take the other ocean province that I can see from my little underwater holdout. Blood slaves are delivered to the priestesses who just built those two new temples. 4. Extract blood price from Arcoscephale (372 gold). I would post Turn 40 at this point but we're starting to get into a time in the game where other players should probably provide some input as well. This whole update has been light on screenshots, and the screenshots I would add here might be a little spoiler-y. Instead let's close with a map of the world as I know it, circa Turn 39.